It is that time of year again; time for my annual ASG spring sewing retreat! Besides loads of sewing time, good friends, laughter in abundance, and a wee bit of wine at night, this annual event means NO COOKING for four days! So in preparation for my event, I want to share this excellent advice. I can’t guarantee my hair will be in order for all 4 days, but there will not be a whit of indifference lurking in our sewing rooms at the retreat center. I have 4 bags cut out and prepped, a Chanel-esque jacket with a wonky sleeve that needs some adjusting, a new blazer pattern muslin ready to fit/adjust, some Asian-inspired cotton pajamas to be sewn, and a couple of toddler purses to match completed garments that need to get sewn up. I hope you have fun sewing over the next few days too! I am not sure whether to call Ty Pennington or FEMA. Someone decided that re-finishing the hardwood floors in our house would be a good idea. 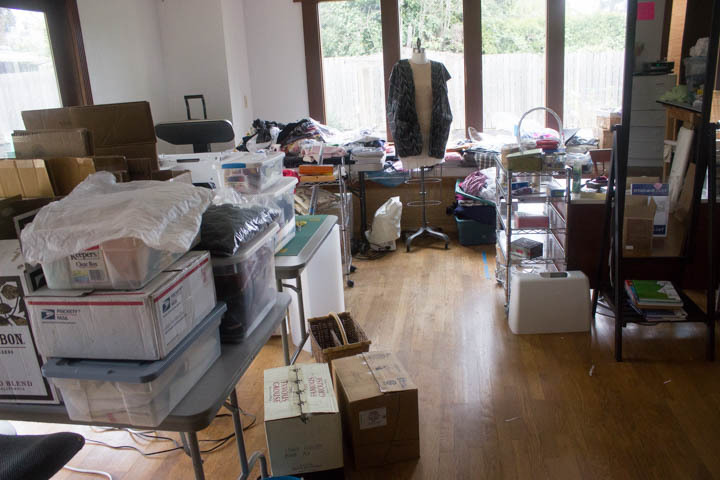 That same someone is now having a panic attack, because cleaning, sorting, organizing, and packing up a sewing studio is no small task. After signing on the contractor’s dotted line, I spent the next few days hiding in my bedroom eating dark chocolate and drinking red wine getting my courage up for this task. Now I am in extreme clean-out mode. Selling, donating, adding to the landfill. Cathartic and exhausting at the same time. By mid-May there will be sparkly new floors. There might be fresh paint on the walls. 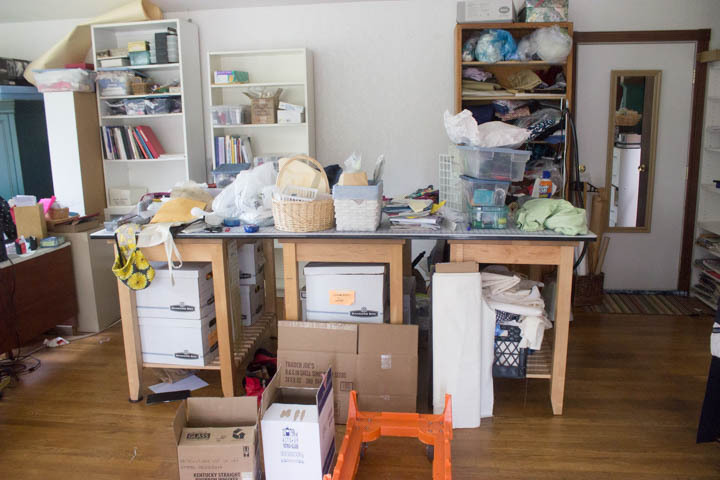 There will be new storage systems to hold a reduced volume of fabric and sewing paraphernalia. In case you have been wondering about the radio silence around here, now you know why. 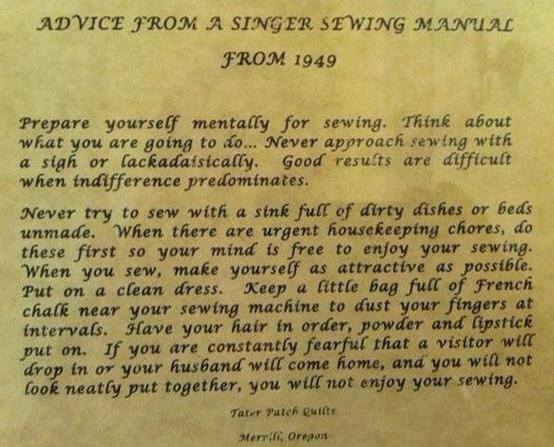 Please, tell me your sewing stories, because there is precious little of that going on around here these days!! If you haven’t gotten on the Bionic Gear Bag crazy train, you might just be living under a sewing rock. 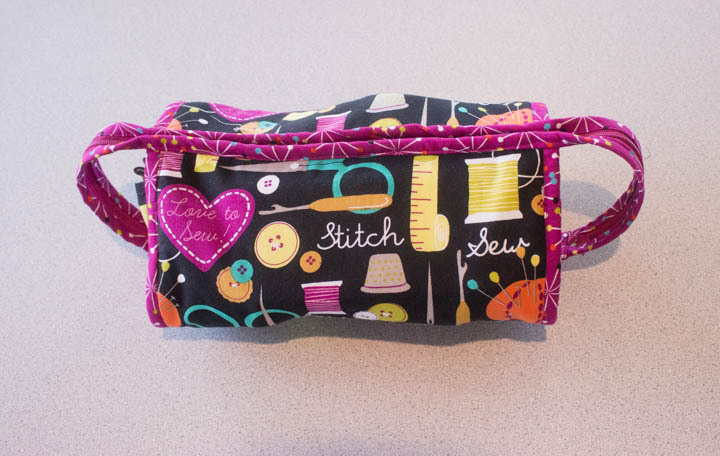 Winner of the Craftsy.com “Best Sewing” Pattern Design Contest for 2014, this handy sewing accessory was designed by Ripstitcher, who goes by Sally Thompson in her non-sewing life. Above is my first version of the BGB, and wow-eeeee do I love this bag. So.Darn.Useful. And I ask you, what good is a bag if it is not useful??? 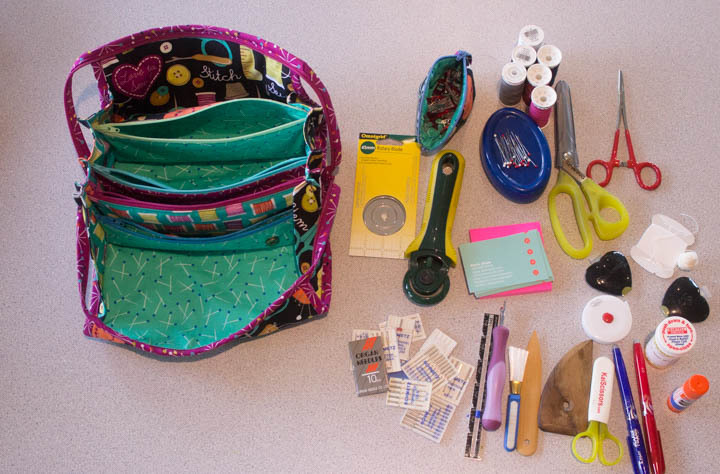 My plan is to use this when I travel to my many sewing retreats and “off-site” sewing adventures. Because we sewists love to travel with our gear, but sometimes it is a pain to collect everything we need. The Bionic Gear Bag solves this problem by providing a handy storage receptacle for duplicates of everything you need. Never unpack it, and your chances of arriving somewhere without an essential item are greatly reduced! Partially packed up, you can see how much it will hold. I have plans to add even more supplies, specifically hand sewing needles and a thimble. And I will probably think of a few other goodies that need to live in this cutie-bag. All zipped up, and yes, everything shown on the table in the image above really IS inside that little package. Crazy how much fits in it! 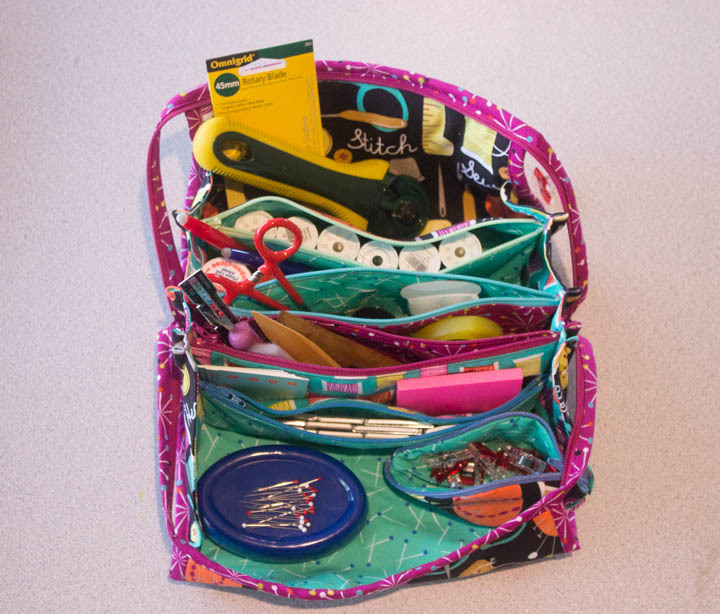 If you get as excited as I am about this bag, there are loads of fun resources to help you through the construction process. I won’t say it is hard; honestly, once the pieces are cut out and the interfacing is fused the hard work is over IMHO. Join the Facebook group, Sew Much Nicer Community. It is a closed group, so you do have to request to join, but just ask and ye shall receive. 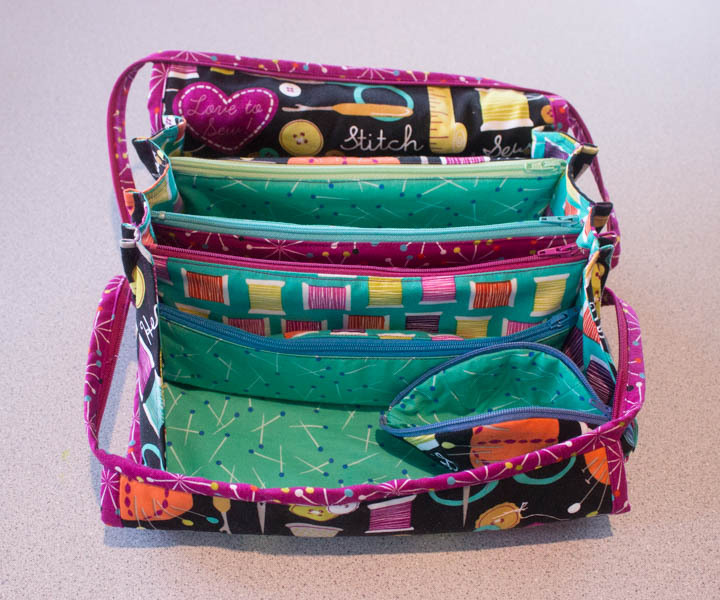 Check out MIchelle Wooten’s Bionic Gear Bag Sew-Along videos. Nice work, Michelle! Buy the Bionic Gear Bag pattern from Craftsy.com. Be sure to post a picture of your completed bag! Share the BGB fun!